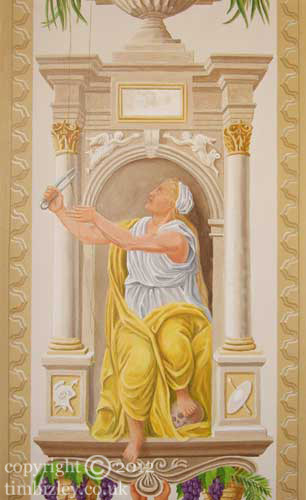 This section of the painted mural canvas depicts an allegory of Fate. Painted mural panels can be used as required in a scheme of design and add interest or act as structural design elements to balance architectural features. Mural work pre-painted onto canvas can be stuck direct onto most substrates. This technique is useful for time critical projects and for ceilings. This type of mural work is especially useful in recreating particular historic periods for interiors such as the 17th century French interior.